One December a road racer I had coached for more than 10 years collided with a dog. The rider’s name is Bob. The dog charged him during a group ride and ended up under Bob’s bike while he was going full speed. Bob launched into the air and eventually had a hard meeting with earth. The dog, unharmed, took off running after a few body rolls on the pavement. When the dust settled and an evaluation was made, Bob ended up with a broken clavicle—or what is commonly called the collarbone. A broken collarbone eliminates many training options for a cyclist: no leg presses, squats or outdoor riding for six weeks, and only the absolute minimal pressure on the hands, arms and upper body. This prescription doesn’t leave many options for staying in form for someone wanting to do a four-hour race in February and therefore demanded some coaching creativity on my part. Before the crash, Bob was just beginning to work on lactate-threshold power. 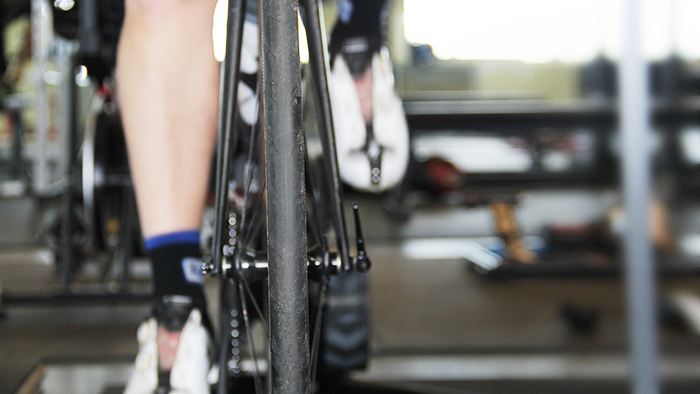 After the crash, lactate-threshold intervals were out of the question—they caused too much pain. Long rides had to be done indoors and for a maximum of 2 hours. The accumulated time above aerobic training zones was very minimal. He continued to do strength-training exercises that did not cause him pain, though there were few that did. To help him keep some leg strength and power, I had him do short, powerful intervals with generous rest on the indoor trainer. The goal was to produce as much wattage as possible for each interval. I didn’t care if power faded through the workout, I wanted him to “go for it” each time. These once-per-week interval sessions were his key workouts for six weeks. We were both convinced it was the short Miracle Intervals that made the difference. Although I was pleasantly surprised at the results, I pondered the explanation of why it happened. Could I reproduce this result again? Ten years ago, this type of training for an experienced cyclist was new to me, nor had I seen any other coach recommend such a non-traditional approach. I did find research that supported my experiment. The study investigated the effects of short-term, high-intensity sprint training on 17 trained cyclists. The cyclists had a minimum of two years of training and had been involved in previous training programs. For the experiment, sprint training workouts occurred twice per week for four weeks. The first workout included four, 30-second sprints followed by four minutes of active recovery. The total sprint work equaled 28 minutes accumulated over the four weeks. The remainder of the training for the sprint group was endurance training. The study concluded that four weeks of high-intensity sprint training combined with endurance training in a trained cycling population increased motor unit activation, exercising plasma levels and total work output with a relatively low volume of sprint exercise compared to endurance training alone. Subsequent research has found that these short intervals may also improve insulin sensitivity, key for people dealing with insulin resistance. I’ll leave that for another column. Try this workout now using our Structured Workout Export. I have designed several progressions of Miracle Intervals and used them in my training plans. I’m certain they can work for you too. If you are just developing fitness, take the time to do sessions where power builds throughout the short intervals. Work your way up to all-out sprints. If you are fit and experienced, these short sprints may help you improve your fitness. Do them once or twice per week. The key is all-out power production from the first one and full recovery between sprints. These sprints can be done outdoors, on an indoor trainer or in a spin class. In the spin class, be certain you recover between each interval. This is not a leg-searing, feel-like-toast-at-the-end-of-the-spin-class sort of workout. You need to control the intensity of the workout for yourself during the class. Even though the research paper only utilized four weeks for the experiment, you may need more time. Bob had his biggest power production results for the sprints during weeks 15 and 18, post-crash. Don’t be afraid to give the workouts time to have a training effect.